Battlefield Crosses and grave markers exist across the whole country. They can be found in churches, memorial halls, chapels, museums and private dwellings. Although lists exist there is no definitive study of them. The aim of this project is to try and provide an online resource which does exactly that. The database will hopefully provide information on as many of the locations and as much detail as possible about the stories surrounding the people whose graves they marked and the people they left behind. It will hopefully be of use to anyone interested in the period, be they local historians, curious casual observers, schools and for academic study. Some lists of these memorials exist. There are also individual blogs, and information within research projects on individual soldiers and entries in books and periodicals. Quite often they list locations, sometimes the men they remember and occasionally the family they come from and the actions they were involved in. Each one has a story behind it, not just the men but the people and the communities they lived in, where they came from and where these memorials were returned as a proxy. The information is scattered and often incomplete. We intend to try and build as complete a picture of the true extent of these memorials, map them all using geodata and fill in as much detail as possible about the crosses and the people they represent. We need your help to complete this project, We will shortly publish a list of known wooden memorials and a basic map, we intend to build an online entry for each one as the information becomes available. This can then be added to by sending us research or using the built in commenting system built into the website for each individual entry. If you would like to help please see our survey page and download sheet (not currently available), this will contain a simple checklist of how to record the site, photograph the cross and location and where to look to start to build a picture of the men the crosses commemorate. We will be able to link the markers back to the original burial sites on the Battlefields of The Great War. Ultimately we hope to build a searchable data set through a series of post broken down by geographical area. This information will be freely available for anyone to access. We also hope we may find some new information that will help to build a picture of these returning men during the centenary years and beyond. We will shortly be providing an easy guide to help you find, photograph and research these sites and how to look into the story behind them. We will also be publishing a list of known locations each all of which will need to be catalogued and photographed. Each cross has a story that will need to be researched, records provide all kinds of clues, communities have a memory, the families of these people may also know more about the people marked on the crosses. We need your expertise in finding out about these aspects of your local history to help build up a picture of how these unusual and personal memorials are distributed, if there are any that are unknown or unusual there may be a story there which we can find out about to add to the pool of information. We need volunteers and interested parties to check their local churches, ask councils, museums and in community centres and church halls. If you are aware of a rumour about the existence of one in the past perhaps since put in storage, or hear a local story follow it up or let us know. There may be additional details in the location, a shell case, an official memorial, something within church records. Either personal records or war diaries that can be accessed to provide more of a picture of a soldier’s movements. The list and guidelines will be available soon. Please check back. 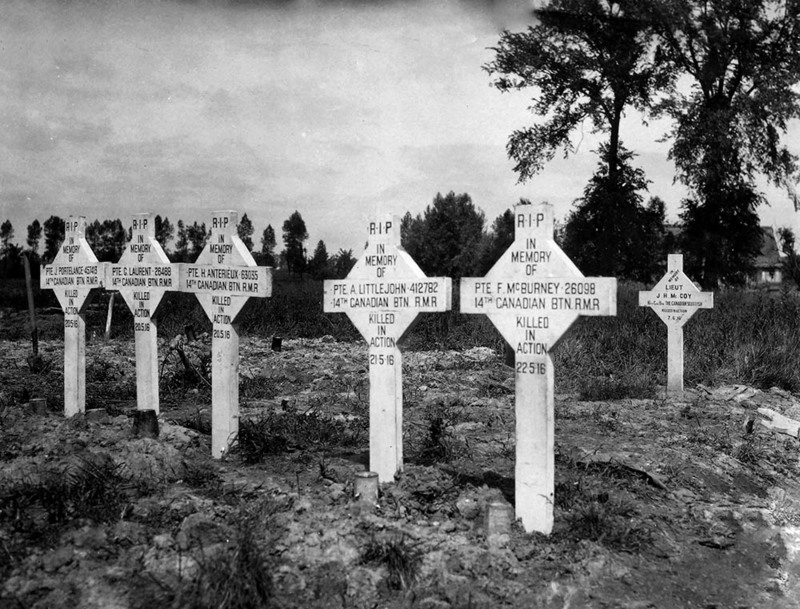 Original Canadian Grave markers: Members of the 14th Battalion, killed over several days in May 1916. These men are found in the Railway Dugouts Burial Ground (Transport Farm) CWGC. There were advanced dressing stations here located in the railway embankment. The graves now still display the same configuration as in the photo – Pte. Portelance in VI. G. 29, Pte. Laurent in G. 31, Pte. Littlejohn in G. 32, Pte. Mcburney in G. 33 and Lt. McCoy behind them. Photo: Library and Archives Canada CC license out of copyright.